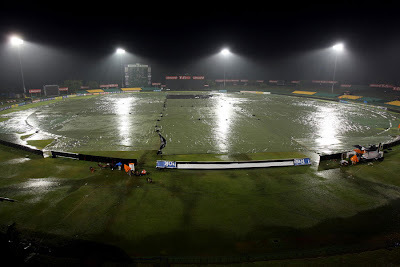 Srilanka and New Zealand 4th ODI Micromax Triangular match no Resuit, on Friday, 20th August, 2010, at Dambulla. In two days, heavy rains forced the abandonment of the fourth ODI of the tri-series and the subsequent reserve day. Srilanka Dilshan led them to 61 for 1 in the first 10, only 70 runs came in the next 20 for the loss of Dilshan and Kumar Sangakkara and then Jayawardene and Silva added 72 off 84 in a partnership both urgent and stable. New Zealand Even as Scott Styris and Jacob Oram provided glimpses of that noble New Zealand tradition, dibbly-dobbly bowling, Mahela Jayawardene and Chamara Silva batted sensibly to make sure Sri Lanka didn't lose their way after a fiery-but-short-lived start from Tillakaratne Dilshan. Toss - New Zealand, who chose to field. Points - Sri Lanka 2, New Zealand 2.